Certification should never be taken lightly. When you do decided to pursue any certification it costs time, effort and money. I have earned my Certified Scrum Master (CSM) license in 5 days. 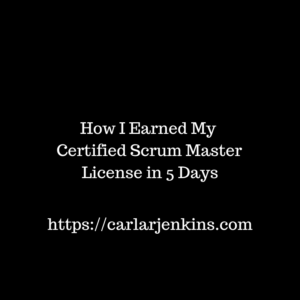 I am writing about my experience to help others decide about pursuing their Certified Scrum Master license. I decided to get my CSM license when I saw many job descriptions asking for CSM along with PMP. I emailed my CSM LinkedIn connections about how they used their certifications. They all had good experiences so I ordered the Scrum book same-day Amazon Prime spending all day Sunday reading it to get ready. I then found the Scrum Guide and a CSM in-person webinar via EventBrite which started Tuesday lasting through Thursday.